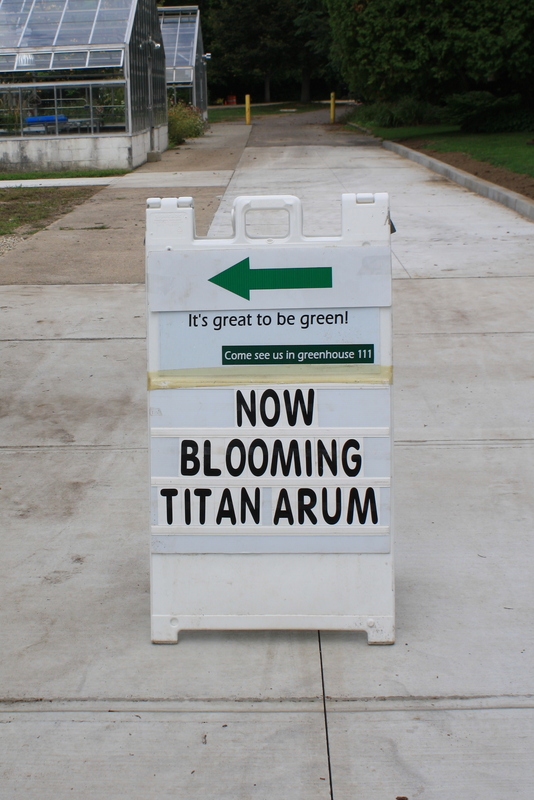 But that’s what you get with a Titan Arum. Audrey began to wilt a little bit by the afternoon of September 2nd. The next morning, she was standing tall again but the edge of the spathe remained slightly wilted. Visitors to the greenhouse both days were thrilled however, to see our beautiful, rare, and fleeting blossom. Pictures of the crowds are being held hostage by a corrupted memory card in my camera, but I hope to liberate them soon! 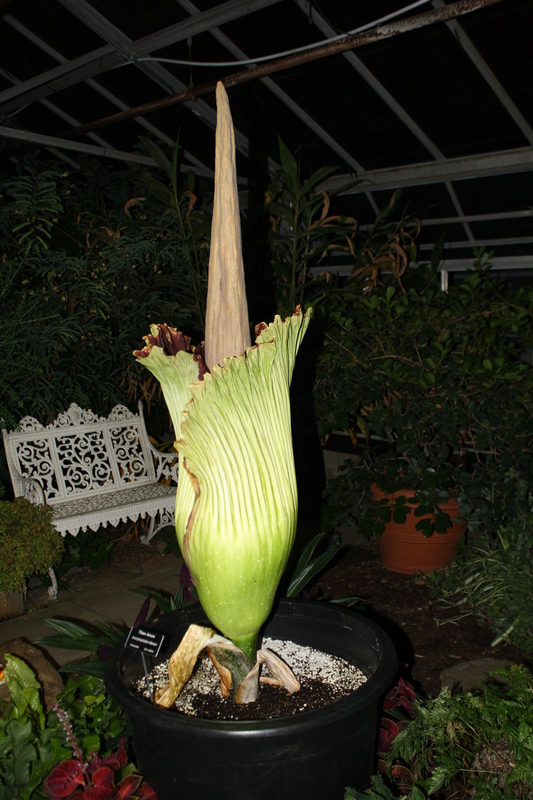 Over the next week or two, Audrey will further close and wilt, until the prehistoric-looking flower is just a memory. When the stalk is completely dead, it gets cut it back. The corm will be repotted into the biggest pot I can find, and then go through it’s dormant period in a dry place (not the greenhouse). About 6 months from now, we’ll expect to see a “spike” — most likely a leaf — pushing up through the soil, and the pot will be returned to the greenhouse to go through the next part of it’s life cycle. Here’s a link to the time lapse video made by Randy Stevenson of URI New Media. It highlights the two days of Audrey’s bloom. I love the part where the sun comes up and shines in through the greenhouse. Thanks Randy! This entry was posted in Botanical Gardens, Conservatory, Greenhouse, Photography, Plants, Uncategorized and tagged Amorphophallus, historic event, rare plants, Titan Arum, tropical plants on September 10, 2012 by uribg. 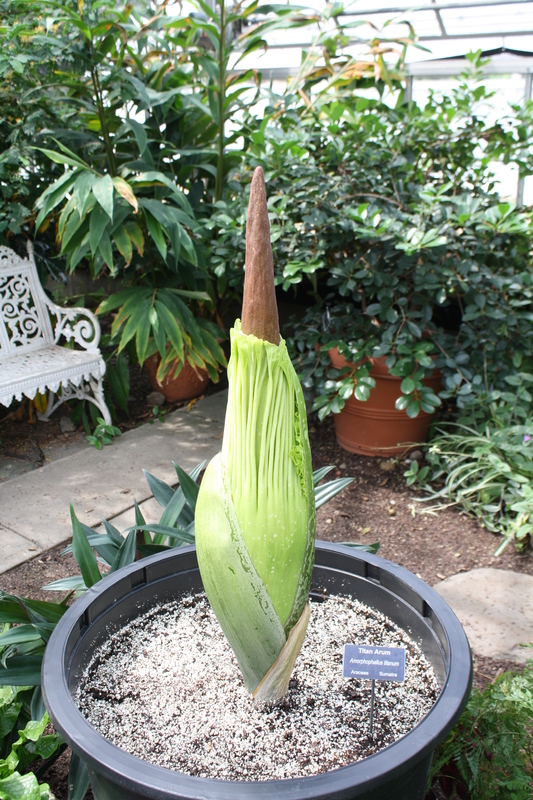 This entry was posted in Botanical Gardens, Conservatory, Greenhouse, Photography, Plants, Public Gardens, Uncategorized and tagged Amorphophallus, endangered plants, historic event, rare plants, Titan Arum on September 2, 2012 by uribg. 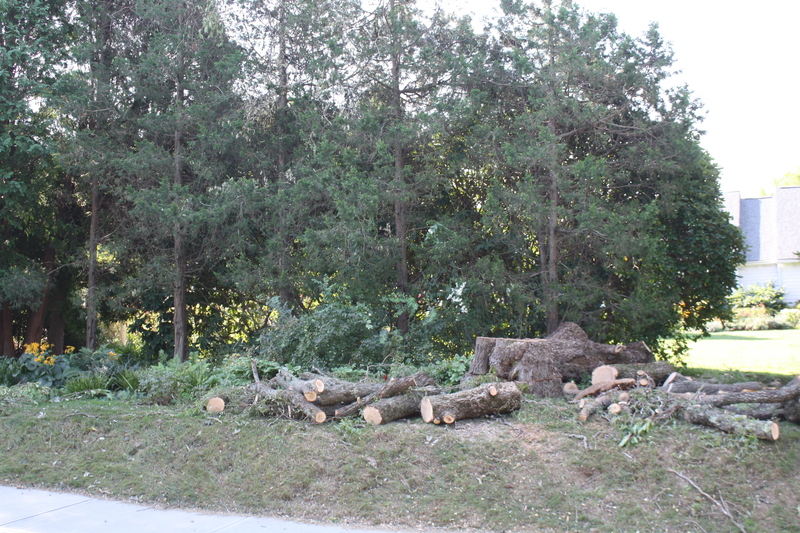 I used to hesitate when trying to decide if a tree needed to be cut down. But not any more! Both the Botanical Gardens and my home garden have become significantly shadier in the past few years. It’s inevitable if there are trees around! And while trees are important, not to mention beautiful, if there’s anything else you would like to grow, the trees have to go. 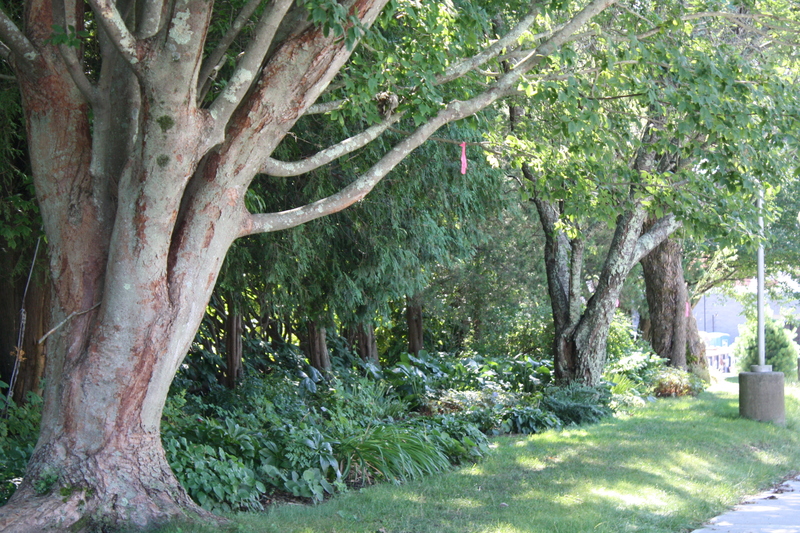 I love them for their sense of permanence, their cool shade in summer, their habitat for birds and wildlife. For firewood, autumn leaves, and fruit. I curse them when I want to grow tomatoes, sunflowers, strawberries or corn! This part of the garden was adapted long ago to the trees which tower over it. A thriving shady border, with plants that love the cool and moist soil. It’s a case of “if you can’t beat ’em, join ’em” for a dedicated gardener! 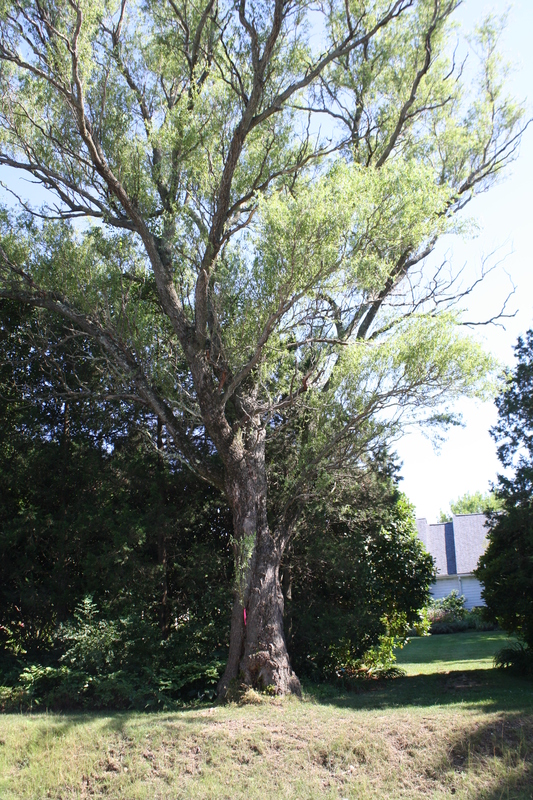 But if you can “beat ’em”, if they are not your neighbor’s trees, not historically or environmentally significant, beloved perhaps but not necessarily important, then she who hesitates is lost. Cut down the trees, make yourself a sunny spot, and let your garden grow. Over the past two days Audrey’s growth has slowed. Instead of 3 inches a day, it has been just one. 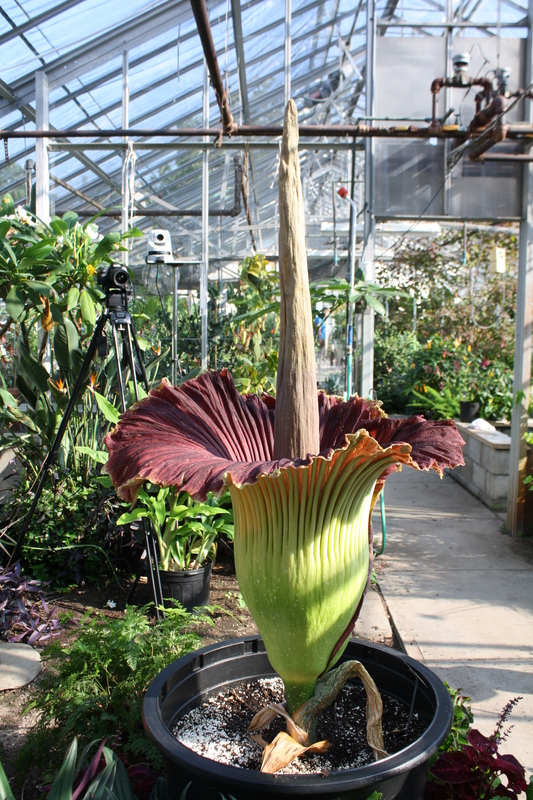 Now at 51 inches, actual bloom time is drawing near! 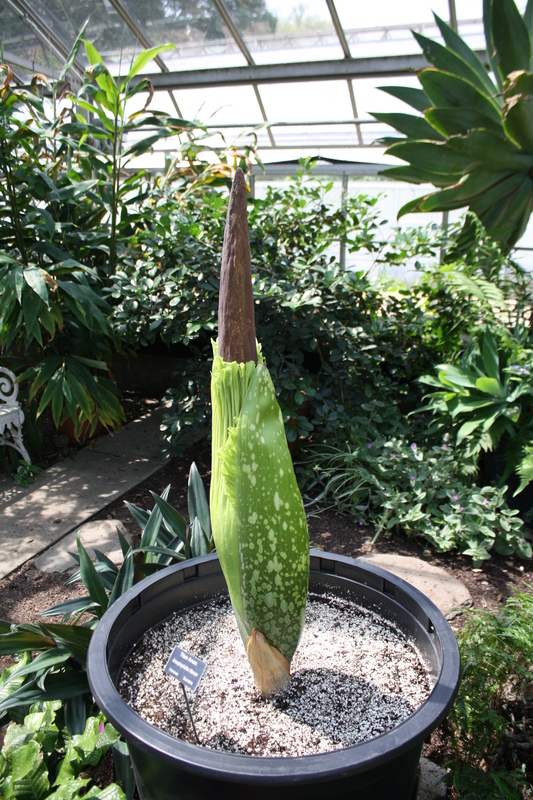 The bracts have fallen away, the spathe is coloring up around it’s frilled edge and all we have to do is wait. Check back with “Thoughts from the Garden” this weekend to get the latest photos of our tropical curiosity. 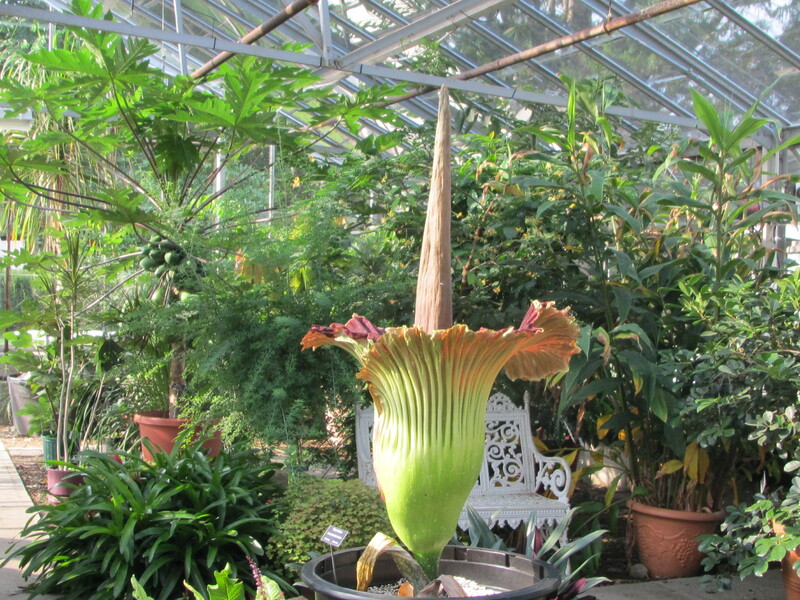 This entry was posted in Botanical Gardens, Conservatory, Gardening, Greenhouse, Photography, Plants, Uncategorized, Vegetable Gardens and tagged Amorphophallus, rare plants, shady garden, sunny garden, Titan Arum on August 31, 2012 by uribg. Audrey the Titan Arum is continuing to grow 3 inches every day. Trying to predict when the flower will really begin to open is a bit like guessing what day a baby will be born! Randy Stevenson, a videographer and technician at URI’s Department of Communication and Marketing has been instrumental in helping us get footage of Audrey. 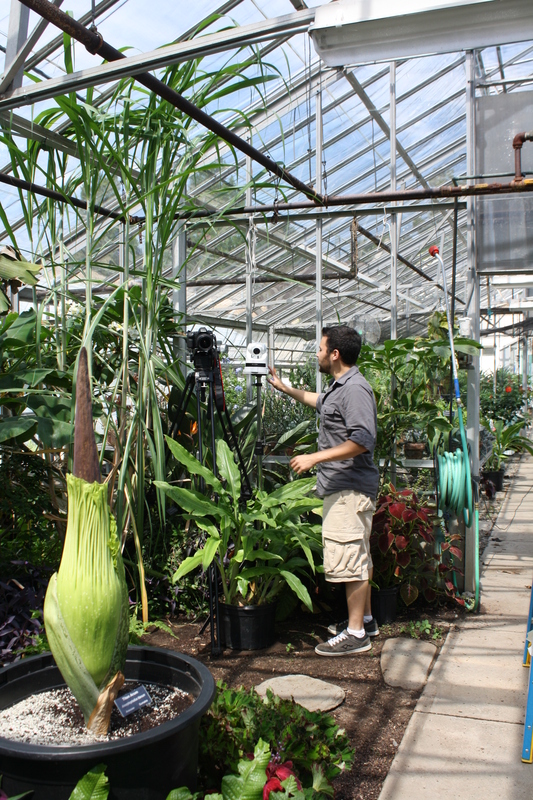 Here’s Randy setting up a live webcast in the Conservatory as well as a time-lapse camera which will show the flower opening. And here’s Audrey this morning standing tall at 48 inches! 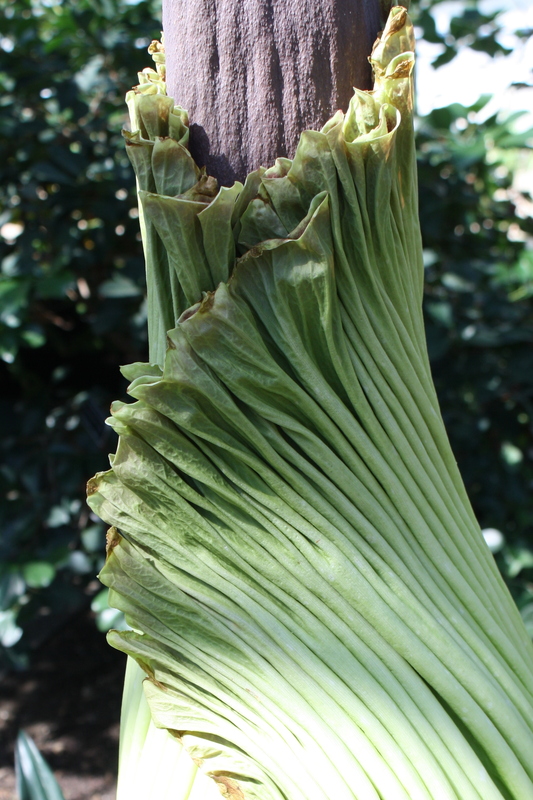 And a close up of the beautiful frilled spathe, the circumference of which can reach up to 3 meters/approx 9 feet. 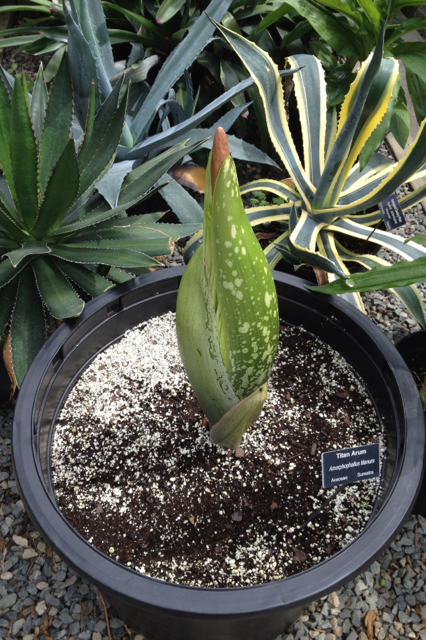 In the last post, I said that A. titanum is endangered. Here’s why: Habitat destruction is occurring through much of Indonesia at an alarming rate and with it ecosystem breakdown – loss of pollinators and seed distributors. 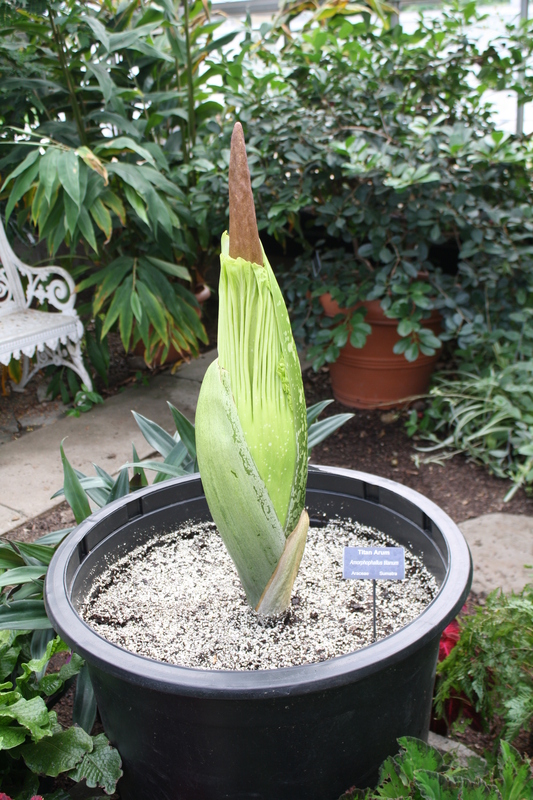 The Titan Arum is long-lived, but does not flower often…less than once a year. This doesn’t give it many opportunities to distribute seeds and reproduce before possible destruction of it’s native rainforest. 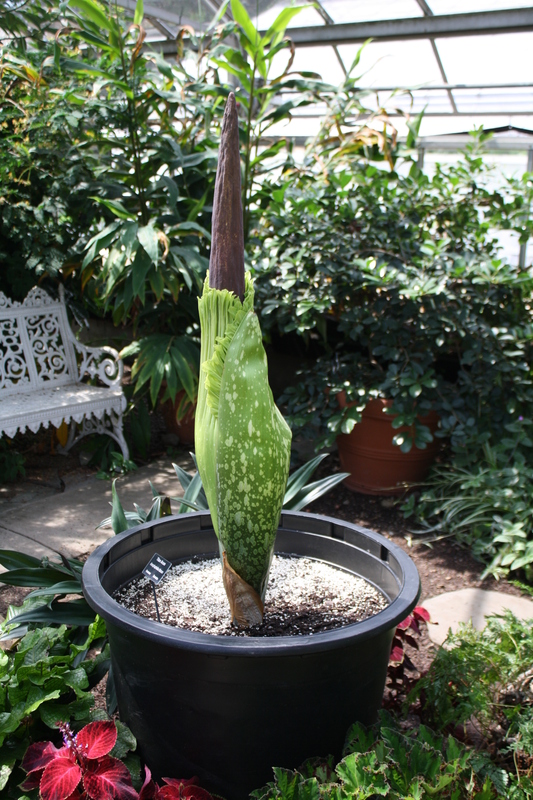 This entry was posted in Botanical Gardens, Conservatory, Greenhouse, Photography, Plants, Public Gardens, Uncategorized and tagged Amorphophallus, endangered plants, historic event, rare plants, Titan Arum on August 28, 2012 by uribg. Amorphophallus titanum, otherwise known as the Titan Arum, is a rare and endangered plant from the rainforest island of Sumatra. 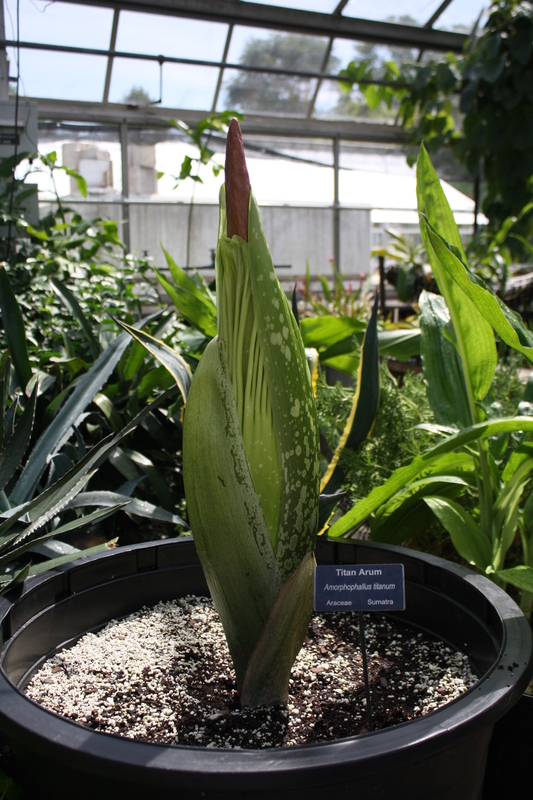 In 2009, the URI Botanical Gardens obtained a Titan Arum corm (a bulb-like structure) to add to our tropical plant collection. 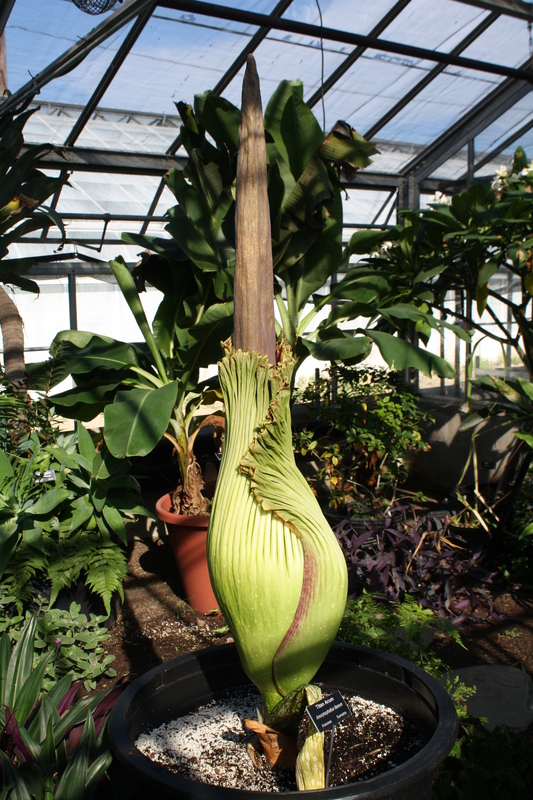 Now, after two years of vegetative growth alternating with months-long dormant periods, “Audrey” is about to flower! 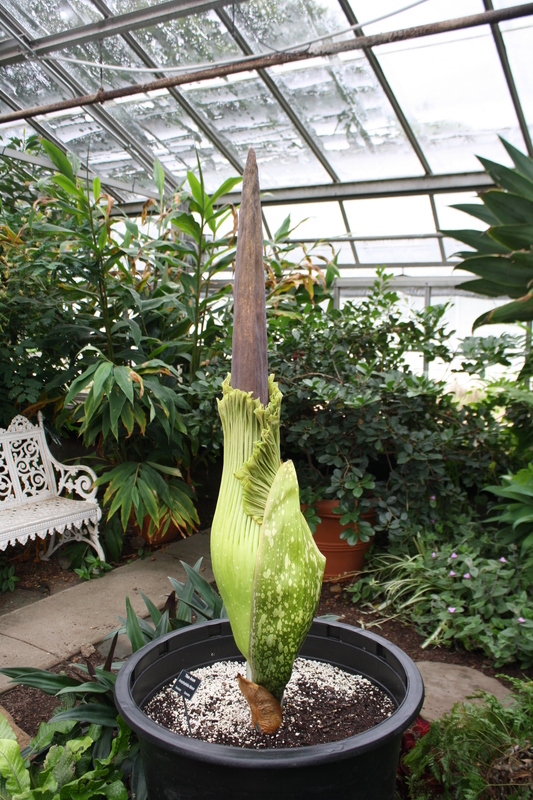 The Titan Arum, also known as “Corpse Flower” for it’s odor of rotting meat, has the largest unbranched inflorescence in the world. In cultivation it can be 4 to 6, or even 8 feet tall, and more in it’s native habitat. Right now ours is growing about three inches a day. It will keep up this rapid pace until it is ready to open, when growth will slow. The unpleasant smell of the bloom, along with the fleshy red and maroon “meaty” colors, attract the flies and beetles (of the family Sarcophagidae) which pollinate it. A.titanum was discovered in Sumatra by the Italian botanist Odoardo Beccari in 1878. A specimen was shipped to the Royal Botanical Gardens in England, where the plant was displayed and bloomed for the first time in cultivation in 1889. It may take 15 years for the Titan Arum to become large enough to bloom, and it is especially rare to see in cultivation. 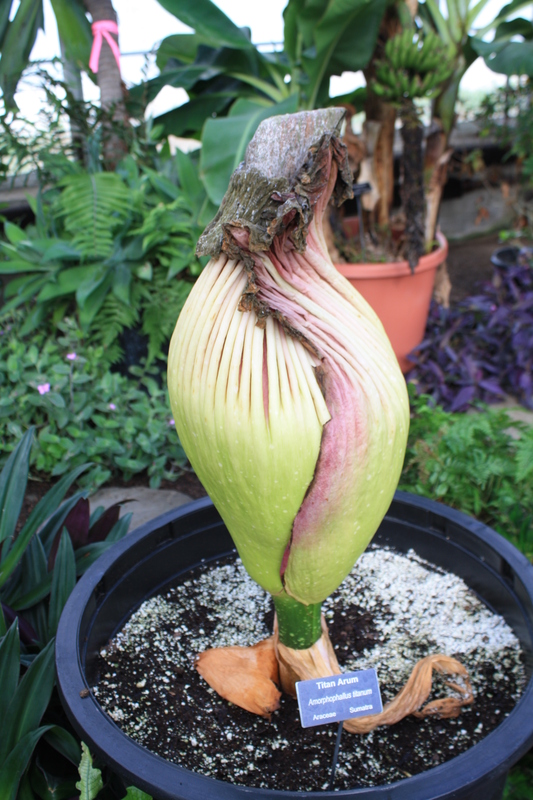 According to the UC Davis website, where more than one Titan Arum has bloomed, these giants have been coaxed into flower only about 100 times worldwide. Definitely a first in Rhode Island! Our plant has grown 9 inches in three days! In addition to height and circumference measurements, temperature is an indicator of impending bloom time. 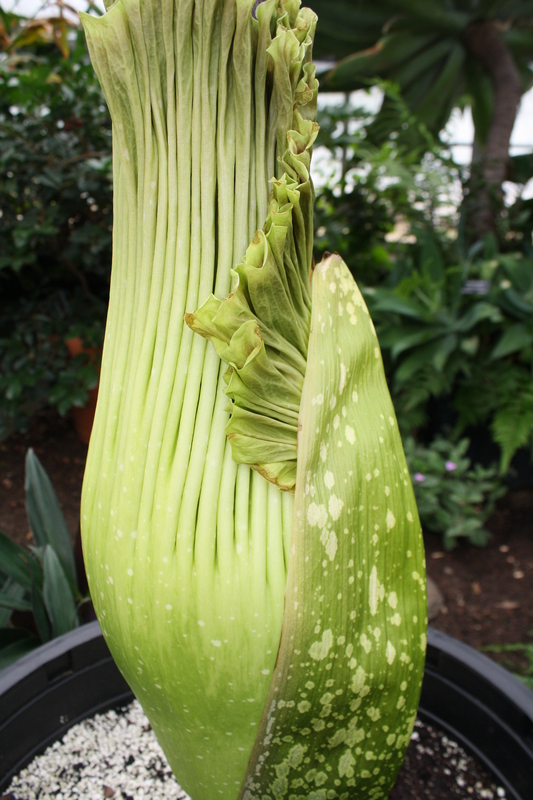 The temperature of the spadix rises to almost 98 degrees F to help volatilize the “aroma” and attract pollinators. The growth chart and more information is on display in the Conservatory. As “Audrey” approaches full bloom, visitors to the Horridge Conservatory will have a once in a lifetime opportunity to see a remarkable and unusual sight. Our regular visiting hours w (M – F, 8 am to 4 pm ) will be extended for the 24-48 hours that the flower lasts. Check back for updates and more photos as we track this historic event! 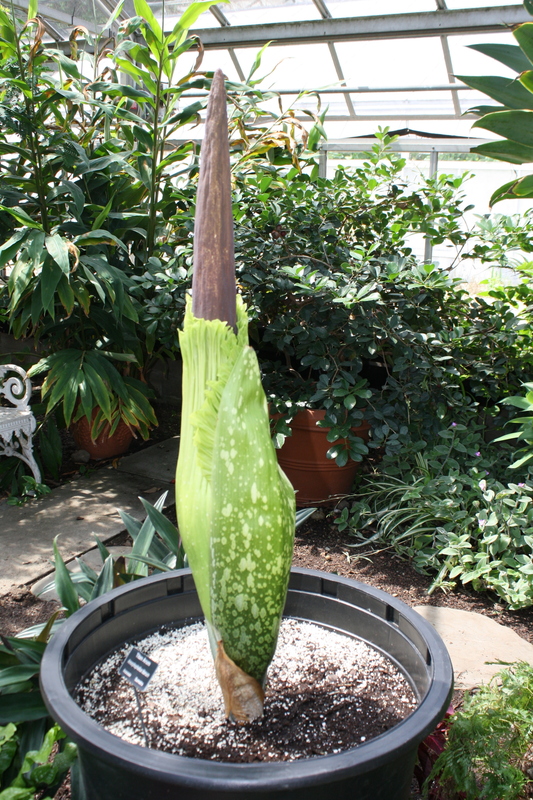 This entry was posted in Botanical Gardens, Conservatory, Greenhouse, Photography, Plants, Public Gardens, Uncategorized and tagged Amorphophallus, endangered plants, historic event, rare plants, Titan Arum on August 23, 2012 by uribg.